Food: Plant materials, some aquatic invertebrates, amphibians, snails, worms, and sometimes eggs from nearby bird nests. Habitat: Plant materials, some aquatic invertebrates, amphibians, snails, worms, and sometimes eggs from nearby bird nests. Disregard of the coot is nearly universal, it seems. Entrenched in our language as a stupid fellow or a simpleton, and in phrases like "silly as a coot," the bird is actually a rail, a family characterized by big, lobed feet, short wings and a reluctance to fly. Coots are the most aquatic members of their family, moving on open water like ducks and often feeding with them. Coots feed in many ways: by diving to the bottom, dabbling at the surface, grazing on land near shore, and stealing food from other diving birds. They are expert swimmers, propelled by wide lobes on their toes, but they are also heavy birds that must patter over the water before becoming airborne. Blackish, rounded, duck-like rail with white bill and frontal shield, white under tail coverts, and lobed toes. Red at upper edge of frontal shield visible at close range. Juvenile similar but paler with duller bill. The coot call sounds like grunts, grating quacks, and hoarse chatters of ke-yik and k-rrk.. Hear It Now! 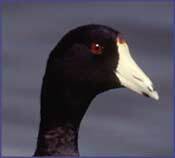 Coots cause can cause damage to golf courses, cemeteries, lawns, and contaminate reservoirs. Their activities can cause real economic hardship, aggravate nuisance situations, or create human health hazards. Coot problems in urban and suburban areas can be a nuisance if left undisturbed. These coots will readily establish nesting territories on ponds in residential yards, golf courses, condominium complexes, city parks, or on farms. Coots can mess up the place with their droppings, their nesting activities and their foraging behavior. They can leave slippery green droppings on paths and driveways close to ornamental lakes and other waterways. Public feeding of these birds in problem areas should be discouraged, and areas of succulent vegetation such as well watered and fertilized lawns – could be replanted with less tasty shrubs and ground-cover plants. Coots can be difficult to remove. Once established, immediate corrective landscaping and behavioral modification is imperative: Remove cover shrubbery; use herbicides to eliminate aquatic vegetation; and reduce fertilizer, especially around pond area, to make grass less nutritionally attractive. Several visual scare products like Gator Guard and Prowler Owl combined with Bird Stop taste aversion should be employed as soon as the birds enter the area, varying in location and type. For more established flocks, audio scare devices like our top selling GooseBuster which projects true geese distress calls through several speaker locations in a random pattern to scare them away. All systems require constant re-enforcement and should be relocated frequently, especially the Gator Guard replica to remain a realistic threat to the birds. The Industrial Bird Hazer has shown effectiveness at repelling coots away from large open areas. See our complete list below of recommended bird deterrent products to repel coots. To speak to a bird control professional, call BirdStoppers at 1-866-411-6287. A "synergy" or combination of bird repellent products typically offer the most successful solution for repelling coots. For bird control solutions, we often recommend using companion products by combining electronic sonic repeller devices or bird hazers with visual scare deterrents, physical bird barriers or scent and taste aversion products. This kind of multi-sensory attack is extremely effective in deterring pest coots for good! Critter Blaster ProSonic animal and bird repeller uses digital harrassment sounds to get rid of pests. 6 acre coverage. GooseBusterSonic goose control repeller features authentic goose alert and alarm calls to prevent acclimation. Industrial Bird Control HazerBird hazer generator sends an invisible, harmless bird repellent haze into the air that makes birds scatter. Bird StopLiquid bird repellent has a taste and smell that birds can't stand. Protect crops and food sources. Coyote DecoyRealistic life-size predator decoy scares away geese, birds and other small pests. Gator GuardRealistic "floating" visual predator scares away geese and other water birds. A Division of Dean Lloyd Enterprises, Inc. Copyright © 2002-2018, BirdStoppers.com, a Division of Dean Lloyd Enterprises, Inc. All Rights Reserved.